← Happy National Iced Tea Day! Imagine opening your mailbox on your birthday and finding valuable gift cards from the best restaurants, day spas and boutiques in your hometown…that’s BirthdayPak! BirthdayPak is a FREE program that brings together the best businesses in your community with the people most likely to be be their best customer…YOU! By joining the BirthdayPak Community, you will receive up to 8 valuable gift cards right before your birthday each year with absolutely no cost to you. 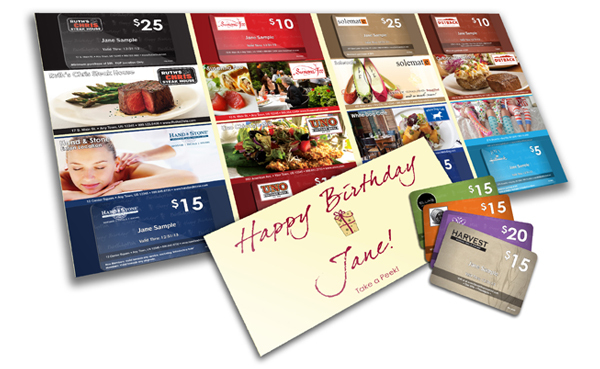 The featured advertisers in your BirthdayPak make these promotional gift cards available to you as a way to make your decision about HOW and WHERE to celebrate your birthday easier. To learn a more about BirthdayPak and to sign up, click here. My birthday is in July. I’m just saying. Thanks to the Coupongy Correspondent from Medford Lakes for this tip.